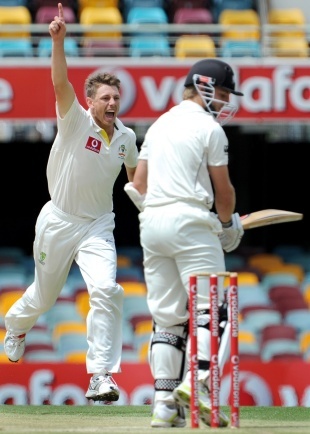 James Pattinson became the 32nd Australia bowler to pick up a five-wicket haul on Test debut. He is also the third Australia bowler after Nathan Lyon and Pat Cummins to achieve the feat in 2011. Pattinson's haul of 5 for 27 is the second-best bowling performance by an Australia bowler against New Zealand in Tests in Brisbane after Dennis Lillee's 6 for 53 in 1980. Australia extended their undefeated streak at the Gabba to 23 matches. Their last loss at the venue came against West Indies in 1988. Since then, they have won 17 matches and drawn six. New Zealand's score of 150 is their fourth-lowest against Australia in Tests since 1990. Four of the top five lowest scores have come at the Gabba. This is the seventh occasion that Australia have beaten New Zealand by a margin of nine wickets or more overall and the third such occasion in Brisbane. James Pattinson achieved in Brisbane what Nathan Lyon managed in Galle and Pat Cummins accomplished in Johannesburg: a five-wicket haul on Test debut to help Australia to victory. The hosts took a 1-0 lead in the two-Test series with a dominant display in the field, ensuring that Michael Clarke's record as full-time captain - he has not lost a series since taking over from Ricky Ponting - will remain intact. The second over of the day was a triple-wicket maiden from Pattinson that almost brought him a hat-trick as well, and New Zealand did not recover from the trauma of those first ten minutes of play. Through a fighting innings from Dean Brownlie and a counterattacking 36 from Jesse Ryder they did make Australia bat again, but victory for Clarke's side was a matter of when, not if, and they were ultimately set 19 runs to win. Not that the chase was without its own drama: Phillip Hughes was caught at gully for 7 when he tried to steer Chris Martin through a small gap, the ball after he was dropped at second slip by Brendon McCullum. Hughes is becoming a feast-or-famine prospect for Australia, having scored 0, 126, 9, 9, 88, 11, 10 and 7 in his past four Tests. Two strong scores in that time is a concern, although he is likely to have the Hobart Test to rectify his trend with neither Shane Watson nor Shaun Marsh expected to be rushed back from injury. David Warner struck the winning runs, a fierce pull for four off Doug Bracewell, and finished unbeaten on 12 from four deliveries, with Usman Khawaja at the other end on 0. Not that much can be taken from Warner's display in such a tiny chase, but it did complete a memorable match for Australia's three debutants. Warner took four catches, Mitchell Starc picked up two wickets in the first innings, although he became less threatening as the game wore on, and Pattinson demolished the New Zealand top order in a stunning spell on the fourth morning. Pattinson finished with 5 for 27 and, like Cummins and Lyon, his five-for on Test debut was also his first five-wicket collection in a first-class innings. Having struck before stumps on the third day, Pattinson picked up where he left off in a remarkable over that brought three wickets as New Zealand failed to handle Pattinson's fine outswing. Martin Guptill (12) got a short ball that was fended to Khawaja at short leg and two balls later, Kane Williamson sent a regulation edge to Ricky Ponting at second slip. Ross Taylor also failed to counteract the swing of Pattinson and tickled a catch behind first ball, to leave Pattinson on a hat-trick, which almost came thanks to a wonderful yorker that Ryder was slow on. Fortunately for Ryder, the ball was just a fraction wide of off stump, but Pattinson's wickets kept coming a few overs later when the nightwatchman Bracewell edged behind for 2. Pattinson had the extraordinary figures of seven overs, five maidens, 5 for 7. It was the sort of display that, combined with the emergence of Cummins in South Africa, promised a bright future for Australia's pace department. Lyon deserved credit as well for picking up 3 for 19, taking his tally to seven wickets for the match. He bowled with impressive flight and turned the ball significantly, and it was Clarke's confident use of the offspinner that ended Ryder's near run-a-ball innings on 36 when he lazily lofted to mid-off, failing to clear the infield as he intended. It was a terrible piece of judgment from Ryder, who as one of the last recognised batsmen needed to settle in for a long innings. His departure left New Zealand at 6 for 69, and it was only through Brownlie and Daniel Vettori that the visitors made Australia bat again. Brownlie was again impressive after his first-innings half-century but straight after lunch he was caught upper-cutting off Peter Siddle for 42, trying for some quick runs as his partners ran out. Vettori (17) had gone in the last over before lunch when he tried to steer Michael Hussey's medium-pace to third man and was taken at slip. Without Watson in his attack, Clarke showed a willingness to try different things, although Hussey has become something of a golden arm under Clarke's captaincy, with three wickets at an average of 15, compared to two wickets in 58 Test under Ponting. Warner even bowled an over of legspin and nearly struck first ball when Brownlie's flat pull was dropped at deep midwicket by a diving Pattinson. Lyon collected the final two wickets, including Martin caught at mid-off for his 31st Test duck. It left Australia certain of retaining their powerful record at the Gabba, where they have not lost a Test since 1988. They will head to Hobart confident: Australia have never lost a Test at the venue. New Zealand have drawn two of the three Tests they've played at Bellerive, but a more mature batting display will be required for them to avoid losing the series 2-0. None of their top five made a half-century in this game. They have four days to work out why.